Yes, this does remove the spell from your deck. Join the discussion on our forums! Come discuss Grand Archivist over in our dedicated Grand Archivist discussion topic. At the end of your turn, cast a spell from your deck (targets chosen randomly). Got him as a selection in arena and decided to try my luck for shits and giggles. First turn: he copies himself with Molten Reflection. Second turn: one Grand Archivist puts in a secret and the other goes Pyroblast on my face. I still happened to win, but having him in a deck with damage spells is probably not a good idea, especially since he actually removes the spell from the deck when casting it. Very cool concept, but the card itself is pretty bad. This guy reminds me of Rubick. Voice is pretty similar, and he even has "Grand" in his title! Steals spells instead of using his own. Can not choose the right target in teamfight. Apparently, having multiple of this triggering together can still cuts your opponent's timer. Seems like Blizz never fix the DDoS bug for good. What if there's no target? Like it pulls Mind Control from deck on an empty board, does the card get discarded basically? If there's no possible target for any spells in your deck, nothing happens. The card isn't even drawn or revealed. Mind Control, for example, only triggers when your opponent has a minion AND you have an empty space on the board. is a cast effect so does that mean u dun minus a card from yr deck after yr turn? example u cast free from amber so u have 2 copies but since u cast it does it minus 1 or remain? 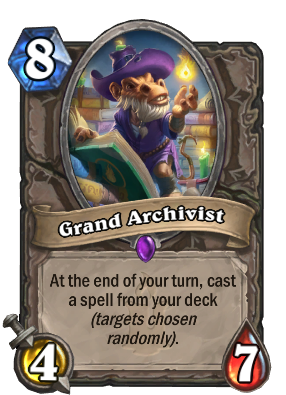 Yes, the spell is removed from your deck when Grand Archivist's ability triggers. How amazingly soul crushing would it be for this to cast the 3rd candle from The Darkness, just in time for it to rip your face off next turn untouched by summoning sickness. Why do people think this is bad? This like a Y'sharj equivalent. You don't put Y'sharj in every deck but make a deck around it with synergistic cards. It's atleast playable in its own deck. I think this card can be in a T4 or T3 deck. Plays great with Jade Druid, plays great with freeze mage, and plays great with secrets in general. Not meta defining but don't write it off. So how is randomly throwing your core combo around "playing great"? Assuming it doesn't actually remove the spell from your deck to cast it (and arguably even if it does), this is absolutely a build-around card. Try running this in a Mage deck, probably an elemental one, where your only spells are Blizzard, Flamestrike, Arcane Intellect, Greater Arcane Missiles, and maybe Cabalist's Tome, or certain Secrets (such as Ice Block)- basically anything untargeted where there's no chance of a misfire. Hell, play it with Molten Reflection when it's the only minion on your board! Even if it doesn't live past the turn you play it, it'll pay for itself. If it lives for multiple turns, it'll win you the game.